« Are We Getting the Blue Jays All Wrong? One morning recently, a great parliament of crows flew over the apartment heading towards the bay. I estimated fifty at least. They boiled around the air column over the empty parking lot of the South Brooklyn Marine Terminal, before turning right to head northish along the coast of Brooklyn. They must have been roosting inland. They didn’t make any noise that I heard, so I couldn’t tell if they were American or Fish. (American or Fish should be a game.) Both species are found here year around. 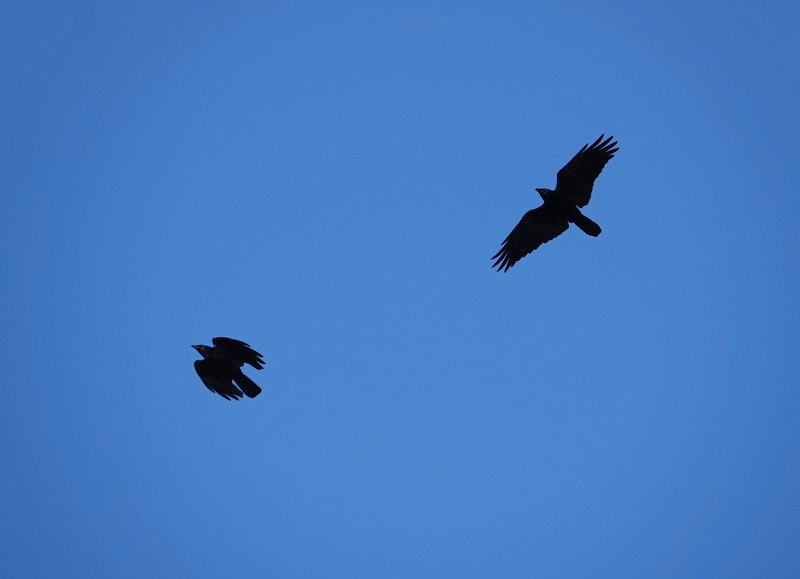 A few days later, I saw at least twenty crows flying over Bush Terminal Park. These were vocalizing, and so identifying themselves as Fish Crows. They were relatively low, too, so I snapped a picture or two.